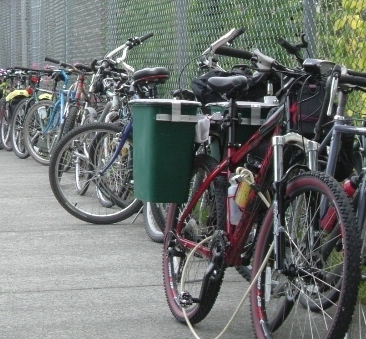 Some of the bikes leaning against the fence at the celebration for Bellingham's Bike To Work Day 2005. With our sizzling hot housing market, I wonder if some developer could set up a subdivision that is car free? Only bicycles, deliveries, pedestrians, emergency vehicles would be allowed on it's streets. I bet houses would still sell like hotcakes.